How do you trade with the enemy? For millennia, civilizations have been at the mercy of their trading counterparts, thriving or dwindling based on the availability of resources. This is especially true in the Arctic, where Brown University professor Doug Anderson has been studying trade relations in Northwest Alaska. Anderson's research focuses on how warring tribes in extreme and harsh environments survived via a critical trade network over the past 10,000 years. For the past 50 years, Anderson, an archaeologist and anthropologist at Brown University, has studied Eskimo and other Native Americans in the region. Most recently, he has been studying Eskimo and Indian interactions at settlements along the lower half of the Kobuk River. Since 2010, his research, which is partially funded by the National Science Foundation, has focused on how warring tribes in extreme and harsh environments survived via a critical trade network over the past 10,000 years. The research team, which launched this study in 2010, began by mapping distributions of raw materials from their sources to an archaeological site along the river. In addition, Wanni Anderson, Doug’s wife and renowned oral historian, collected oral histories with the help of locals. Life in the Arctic—then and now—can be especially dangerous and cold. When resources in their home region fail, lack of trade could prove to be a tribe’s death sentence. Yet the tribes did survive and co-exist, though often not peacefully. According to some ethnological data, communities often fought each other. Given the social dynamics, the naturally harsh climate, and the added complication of environmental change, it is remarkable that the majority of the tribes in the area flourished. Anderson’s research aims to identify the characteristics that led to their survival. The team's archaeology site delivered surprising artifacts, including human remains. Anderson and his team have been focusing on a region where, according to the prevailing view of anthropologists, relationships were so antagonistic between tribes that they wouldn’t intermarry. Somehow, the tribes overcame their antipathy to form successful trade networks. In one instance, researchers believed they had a “silent trade,” where goods were left in neutral territory and the tribes did not have to interact. In other instances, they called truces and had trading fairs. Anderson’s research suggests that the prevailing view might be incorrect and that tribes shared much more with each other than we have thought. The tribes needed natural resources and material for tools and shelter. In addition they needed food that required trading. Because the period covered by this specific research is so broad, Anderson says he expected to see trade for specific items ebb and flow, based on availability and need. So far, this has proven to be the case. 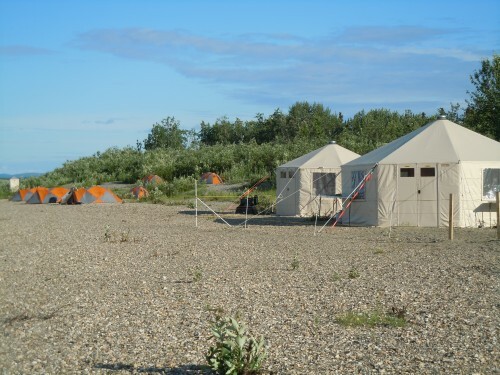 Early on, the team discovered an archaeological site about 10 miles upriver from Kiana, a small village in Northwest Alaska that added a surprising dimension: western artifacts in the heart of an old abandoned Eskimo village. This is remarkable, Anderson said, because the site predates known arrival of western explorers. In other words: the goods unearthed in the village worked their way to that location via a complex trade network between tribes that were likely at war. It so happened that the site of the discovery was known to have been the home of a very powerful shaman. Initially, some Kiana villagers did not want the excavation to continue. Anderson worked with the villagers to gain their trust and, ultimately, permission to continue with the research—despite the early objections of some of the residents. Some of the artifacts from the time, such as one sub-species of marmots, are no longer present in the region today, which underscores how a changing climate can affect a region’s ecology. Anderson’s research attempts to make sense of a complex web of relationships. To that end, it reveals minute details that, when pieced together, give a big picture understanding of a vast region over time. To hone the work, Anderson’s team used radiocarbon dating and tree rings to specify the regional chronological framework. 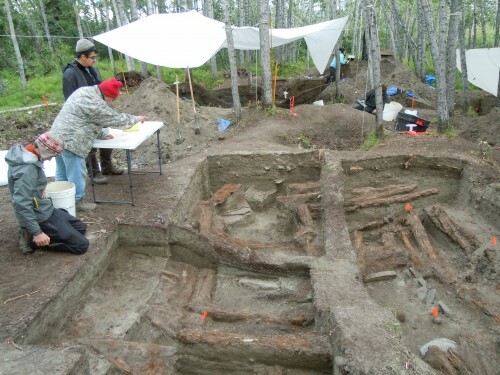 They also undertook the archaeological excavation of an old village, Igliqtiqsiugvigruaq, obtained the oral histories, and undertook geological analyses of stones from the site to identify the sources of some major raw materials that were often traded like slate, chert, and obsidian. So far, the evidence shows that despite the turmoil and obstacles facing them, the majority of peoples endured climate change and social tumult, says Anderson. As for the impact on the culture from climate change, well, that’s a complex link to prove. For example, after 1400, people moved from their whale hunting villages at Cape Krusenstern to areas like Kotzebue in order to be closer to the fishing grounds of Hotham Inlet. And, although major resources like caribou and fish fluctuated over time – and impacted where people settled and with whom they traded – Anderson still has not been able to correlate these cultural changes with climate/environmental changes. At the end of June, Anderson and his team will return to the excavation site, where they found human bones. They have permission to continue their dig and to analyze the remains, which is rare. The findings will shed light on the health of the people of the village. Were they starving? Plagued by disease? Or were they healthy?